The D&SNGRR's new Cascade Canyon Express is just two hours in duration. DURANGO, Colo. - March 12, 2019 - PRLog -- The Durango & Silverton Narrow Gauge Railroad (D&SNGRR)™ (http://www.durangotrain.com/), which offers distinctive year-round rail experiences and special events to passengers of all ages in the remote, scenic wilderness and high-mountain landscape of Colorado's San Juan National Forest, today announced the introduction, schedule, and fares for the Cascade Canyon Express, a brand-new excursion series set to begin on June 17 and run through August 14. Specifically designed for today's busy travelers, the Cascade Canyon Express is the D&SNGRR's shortest non-special event excursion ever offered in the railroad's illustrious history at just under two hours in duration. Departing the D&SNGRR's Rockwood station at 11:10 a.m., the Cascade Canyon Express winds through the scenic canyons and along the high mountain curves of the pristine San Juan National Forest to Cascade Canyon, and then returns along the same route to Rockwood by 1:00 p.m. Using the railroad's fleet of diesel locomotives, the Cascade Canyon Express is ideal for families with small children, late risers, or those with limited time to spare, but who still want to experience the iconic vistas and jaw-dropping scenery indicative of the D&SNGRR line. 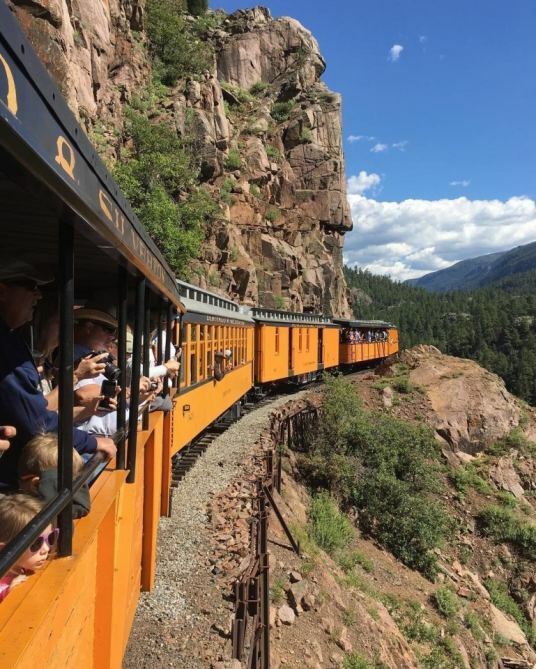 "For several years now, many guests have requested shorter excursions, so we developed the Cascade Canyon Express as a viable solution for those travelers who desire the historic scenic railroad experience on the D&SNGRR line, but have limited time for various reasons," said Allen C. Harper, head of the Durango & Silverton Narrow Gauge Railroad, and chairman and chief executive officer of American Heritage Railways. "In addition, the Cascade Canyon Express is also an affordable, flexible option for riding the D&SNGRR, with its late-morning departure time, and coach and gondola fares at substantially lower rates than those for round trips to Silverton. Based on consumer sentiment and demand, we fully expect the Cascade Canyon Express to be an immediate hit with summer travelers, particularly families with small children." Because of its already short trip duration, the Cascade Canyon Express does not feature a layover in the canyon, as is the case with the D&SNGRR's late fall, winter, and early spring excursions there. Additionally, the Cascade Canyon Express does not have a concession car, so guests are encouraged to bring their own snacks and non-alcoholic beverages. Cascade Canyon Express tickets are available now by calling (888) 872-4607, or online through the railroad's website at www.durangotrain.com. Coach tickets are $64.00 per person for adults, and $40.00 per person for children ages 4-11. Gondola tickets are $69.00 per person for adults, and $45.00 each for children. Children under the age of four are free. All tickets are subject to an eight percent historic preservation fee. Guests with cars can park in the Rockwood station lot for $5.00, while the parking fee for recreational vehicles (RVs) and busses is $7.00. The D&SNGRR is not providing bus service to Rockwood for this excursion.